Very Good. The new inspirational novel from the New York Times No 1 bestseller, for fans of Mitch Albom and Francine Rivers. B-format paperback. 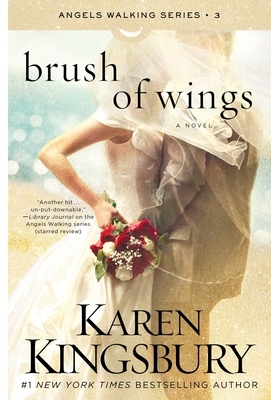 352 p.
Brush of Wings by Karen Kingsbury is the third book in Angels Walking series. Orlon is sending Ember, Beck, Jag, and Aspyn (an Angel Walking team) on an important mission. They need to make sure that a little baby gets born and to keep four individuals alive and together. Mary Catherine Clark is leaving for Uganda to help out at a new orphanage. She has always wanted to do this. However, Mary Catherine has a heart condition that is now life threatening. Mary Catherine needs a new heart, but she is not letting that stop her nor is she telling anyone about it. Marcus Dillinger is a baseball player with the LA Dodgers who cares for Mary Catherine, but she keeps pushing him away. She feels that he should get a chance at love with someone who might not die. Sami Dawson is Marth Catherine's best friend and roommate. Sami works at the Youth Center where Mary Catherine also volunteered (until she decided to go to Uganda). Sami keeps getting Mary Catherine to confide in her, but Mary Catherine is keeping mum. Sami is in love with Tyler Ames, a coach with the LA Dodgers (and a friend of Marcus). Can the angels work to keep these four people alive and the demons at bay? It is imperative that their mission be successful. Brush of Wings is basically a long (sappy) romance novel with angels, scripture, and prayer thrown in. The novel contains quite a bit of scripture and prayer (basically every page someone is praying or asking people to pray). I found the book hard to get into (I actually never did get into the book) which takes away my enjoyment of the book. Mary Catherine is the main focus of the book, and I found her to be a martyr. I did not like her and found her extremely annoying. This is the third book in the series, but I believe the novel can be enjoyed without having read the first two books in the series (I actually did not know it was part of a series until I started reading the book). I give Brush of Wings 3 out of 5 stars. Readers who love Christian romance novels will probably enjoy Brush of Wings. I received a complimentary copy of Brush of Wings from NetGalley in exchange for an honest evaluation of the novel.